This is a very popular and extremely tasty Singaporean home cooked dish that is quick and easy to prepare and can be found in many hawker centers. Minced pork (or chicken) are mixed well together with some fat which provides that springy texture. It is then marinated with Chinese wine, sesame oil, soya sauce and steamed for a few minutes. When cooked, it is then garnished with chopped spring onion, shredded ginger and sliced chilli and served with toppings of salted fish. The full flavours of this dish make it go really well when eaten with a serving of white rice. Chwee kueh or “water rice cake” is a type of steamed rice cake that is a popular and favourite breakfast dish or snack among many locals. It is made up of a mixture of rice flour and water placed in aluminium saucer cup-shaped mounds and steamed. When cooked, the bowl-like shaped rice cakes are then topped and served with fried diced preserved radish or ‘chye poh’ and chilli paste. The saltiness and sweetness of the ‘chye poh’ complements the subtle flavours of the rice cakes. Fish Head/Meat Bee Hoon with Milk is a Singaporean soup-based noodle dish that uses either snakehead, pomfret, batang or garoupa cooked together with bee hoon or rice vermicelli in a rich and tasty broth. This dish is available in a choice of fried or plain fish head pieces or fish slices/chunks and served in a soup made out of fish stock derived from cooking fish bones for many hours. Other ingredients like vegetables, fried shallots, anchovies and Chinese wine are also added to the soup to enhance the overall flavour of the dish. For those who enjoy a more creamier soup texture, evaporated milk can also be requested to be mixed and cooked together with the soup. Fried Carrot Cake or ‘Chye Tow Kway’ is a very common breakfast staple found in many neighbourhood hawker centres. It is a favourite among many locals as most of us have grown up eating it. It is made up of steamed rice cakes that are broken into little cubes fried with eggs, garlic, sweet sauce (for the black version), preserved radish, soya sauce, chilli paste and served with toppings of chopped spring onions. There are two versions available: white or black, and the former (white) version would provide a more subtle flavour of eggs and preserved radish without the caramelized sweetness that comes from frying it together with the sweet sauce. 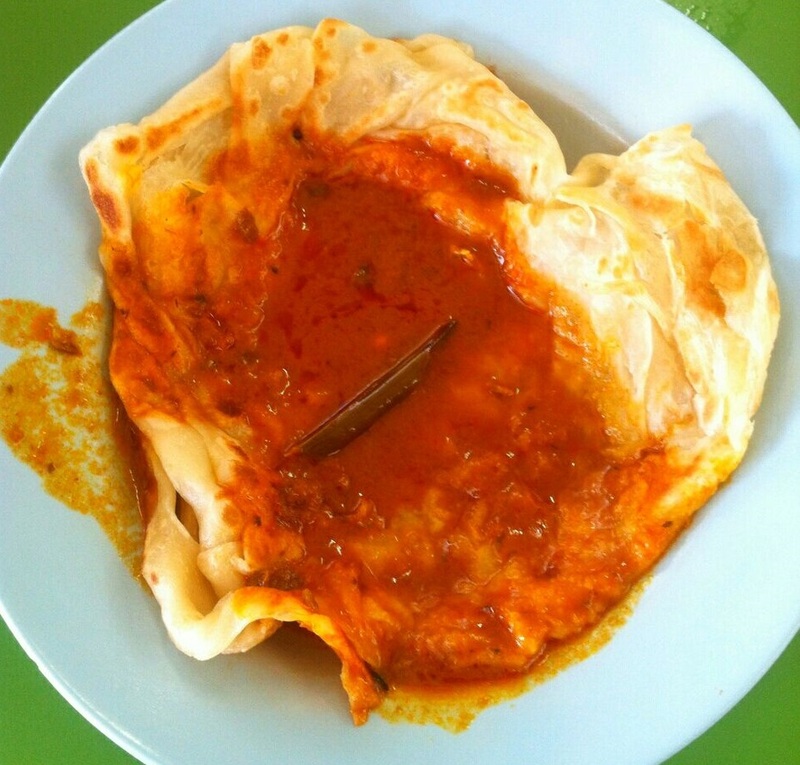 Roti Prata or Roti Canai (as they call it in Malaysia) has its influence from Pakistan and India and is a comfort food for many Singaporeans young and old. It is a pancake made up of flour that is fried over a flat round iron pan and usually served with a side dish of vegetable, chicken or fish curry. For those who are not able to handle the spiciness of curry, they may even eat it with sugar. Roti Prata usually comes plain (kosong) or with egg (telor or plaster), and some other variations may include it being mixed with sliced onion, cheese, banana, sardines and chocolate sauce. Fish head is commonly seen as a delicacy in Asia and they are often widely cooked in curries, soups and stir fry dishes. It is also highly nutritional due to the good fat and collagen found in areas like the gills and cheek of the fish. In this particular dish, the fish head is steamed together with fermented black beans, soy sauce, garlic, Chinese wine and garnished with cut chilli padis and spring onions. When eaten together with white rice, the result is a pleasantly sweet and salty balance of flavours that comes from the good combination of black beans, soya sauce and briny freshness of the fish. This is a comfort food that strikes the heart of many people due to the fact that it is commonly cooked at home. This stew-like dish is easy to make through using very simple ingredients like chicken parts, sesame oil, ginger, dark and light soy sauce, Chinese cooking wine, oyster sauce and spring onion as a garnish. These ingredients are all cooked and simmered together in a claypot for a period of time until the aroma of ginger and sesame oil emits. This comfort food is often eaten with rice due to the good balance of flavours from the sauce based stew. Bak Kut Teh or “Pork Rib Tea” as translated in English is an herbal tonic soup consisting of meaty pork ribs simmered in a rich and tasty pork broth made up of garlic, Chinese herbs, spices and vegetables. The pork ribs are usually cooked in the complex broth mix for long periods until the meat falls off the bone. The fat from the meat also blends with the broth, thus enhancing the overall flavour of the entire dish. Bak kut teh is usually eaten with rice and often comes with “youtiao” or dough fritters that are dipped into the soup and eaten. For that full complexity of flavours, a condiment consisting of dark soya sauce, minced garlic and sliced chilli padi is also used as a dipping sauce.